Against all odds, The Big Short works. In fact, “works” is an understatement for what director Adam McKay has achieved with his improbable adaptation of Michael Lewis’ nonfiction book about the 2008 global financial crisis. Writing in Vanity Fair’s December 2015 issue, Lewis says the following: “My job, as I saw it, was to make the reader badly want to know about credit-default swaps and collateralized debt obligations.” This, in turn, became McKay’s obligation when he made the movie. And one of the major reasons The Big Short succeeds is because McKay does this. Using gallows humor, likable protagonists, and a variety of nonstandard filmmaking techniques (like having characters address the audience directly), McKay maintains a high level of energy for more than two hours and dares us to become bored. 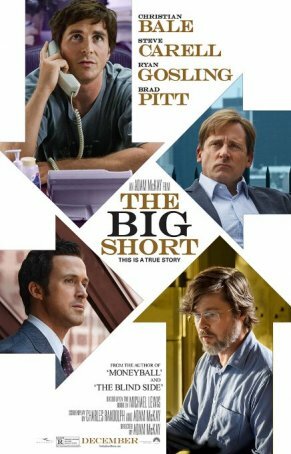 The Big Short merges narrative elements with a pseudo-documentary exhumation of what happened during the years leading up to the 2008 collapse. The characters are all either real-life people who told their stories to Lewis or slightly fictionalized versions (with the names changed to protect the guilty). The film is both instructive and highly entertaining. McKay goes out of his way to inform viewers about the underlying causes of the instability but he does so with tongue-in-cheek irreverence. One device he employs is to hijack celebrities to provide explanations. Margot Robbie gives a lesson while enjoying a bubble bath. (Admittedly, it’s tough to concentrate on what she’s saying). Celebrity chef Anthony Bordain uses a fish stew analogy. And Selena Gomez plays blackjack. This is more in McKay’s wheelhouse than one might initially assume. The former SNL writer has previously directed a handful of features - all comedies (including Anchorman and its sequel). That background is an asset for The Big Short. The comedic edge gives the film greater resonance. Not only does it leaven the heavier material but it impels the narrative with a natural momentum. The snarky tone will appeal to those who have always been distrustful of Wall Street’s business practices. McKay in no way uses this for humorous sport, however; there’s a deep current of anger and outrage underlying the comedy. The Big Short cherry picks characters from the book - not every person profiled by Lewis makes it to the screen. The focus is on five individuals: Michael Burry (Christian Bale), a socially awkward financial genius; Mark Baum (Steve Carell), a broker with a conscience; Jared Vennett (Ryan Gosling), a rapacious investor out to make a killing; and the duo of Charlie Geller (John Magaro) and Jamie Shipley (Finn Wittrock), a couple of amateurs who see the opportunity of a lifetime. Burry is the first one to identify the dangers inherent in the way Wall Street is overvaluing bonds backed by sub-prime mortgages. As early as 2005, he is sounding the alarm bell but no one is listening. So he turns this into an investment opportunity by “shorting” the bonds - essentially betting that the housing market will collapse. Vennett reaches the same conclusion and discusses it with Baum who, after a private investigation, agrees with him. Geller and Shipley are in the right place at the right time and, acting under the advice of ex-broker Ben Rickert (Brad Pitt), get a seat at the big boys’ table. Christian Bale, who is no stranger to radical appearance changes, de-glamorizes himself in order to portray Burry. Bale adopts some of Burry’s mannerisms and idiosyncrasies (such as his preference for always being barefoot) and believably conveys the sometimes off-putting personality of a man afflicted with Asperger’s Syndrome. Not to be outdone, Steve Carell submerges his physicality and personality, although by nature Baum isn’t as compelling an individual as Burry. While Bale and Carell have the most screen time, a host of other big-name players make appearances including Ryan Gosling, Brad Pitt, Melissa Leo, Marisa Tomei, and Mark Strong. This is the second unorthodox feature adaptation of one of Lewis’ books and is fundamentally more successful than Moneyball. It was possible to fashion the 2011 movie into a slightly off-kilter bio-pic. The Big Short, because of the necessity of educating viewers about a variety of terms and processes, necessitated a different approach. McKay (along with his co-screenwriter, Charles Randolph) found the “sweet spot.” As a result, The Big Short works not only on a narrative level but as a teaching device, and it achieves the latter without seeming to talk down to an audience. There have been other movies about stock market corruption. Most, like Wall Street and J.C. Chandor’s Margin Call (also about 2008), view the situation through the lens of a thriller. McKay, like Martin Scorsese in The Wolf of Wall Street, illustrates that comedy can be an effective tool in telling a story like this, provided it’s used with scalpel-like precision. The cuts made by The Big Short are deep and devastating in what they reveal about how 2008 happened and, tellingly, how little has changed since then.